So. Given my anglophilia and general love of babies and happiness, I’m a wee bit excited over the arrival of William and Kate’s son. 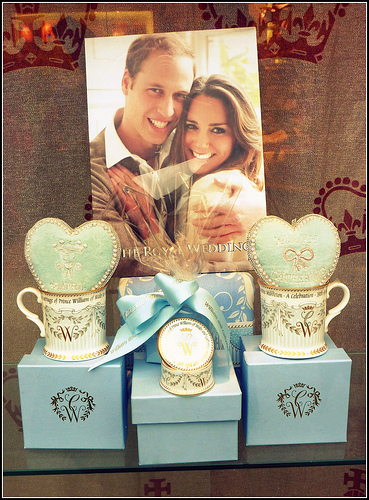 My family was in London just a week before their wedding in April 2011, a time laced with excitement and sunshine. I wish I could have hopped a flight to linger outside Buckingham Palace waiting for the royal decree with so many well-wishers on Monday but, alas, I’m a desk-bound American with no funds or vacation time save what she’s using for her own upcoming nuptials. Still, a peasant can dream. In honor of the Royal Prince (is he a prince already? 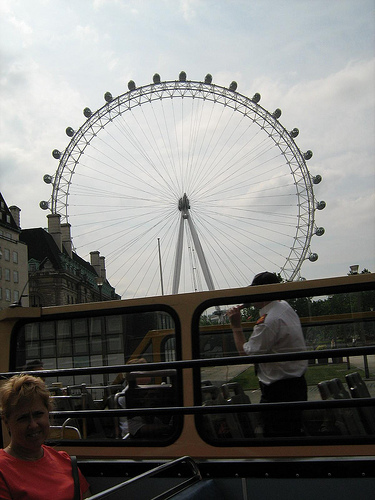 Must Google), I’m revisiting my favorite photos from trips to English trips in 2009 and 2011 today. 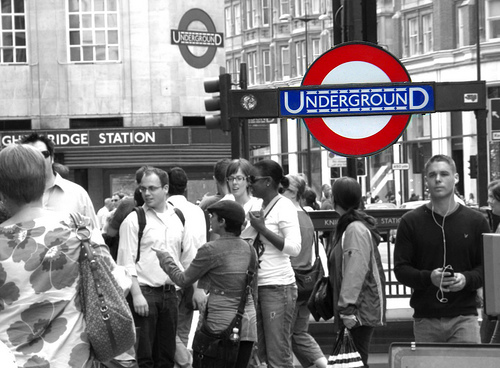 I’ve said it before, and I’ll say it again: London is the city of my heart. My heart hurts a bit looking at these, remembering how exhilarating it was to walk around Trafalgar Square or along the Thames . 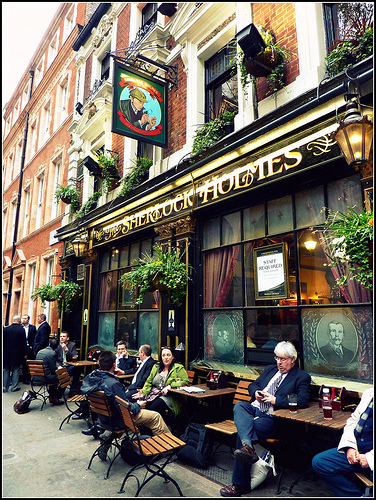 . . some of my happiest days have been spent in London. I really must get back there. For a day, for a week — I don’t know. But I have to go. And I really must go find myself a scone. 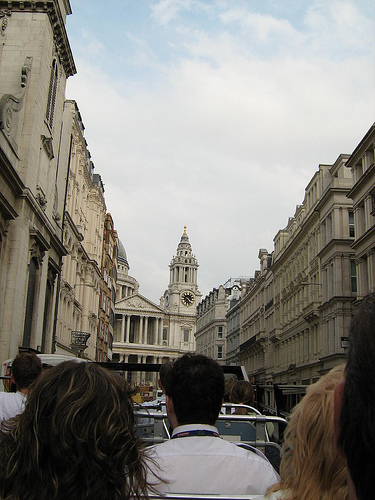 Freshly graduated from college and traveling abroad for the first time in my life, my first trip to London — in May 2007 — found me wandering around with my family and a tiny point-and-shoot camera. I’d barely had my PowerShot a week when we boarded the plane, but I was ecstatic to be going overseas. Dad was our tour guide, plotting out the places we wanted to see in the city before boarding another plane for Rome. In Italy we met up with our tour group (Trafalgar, of course!) and ate amazing food while visiting gorgeous, historic places. It was life-changing. 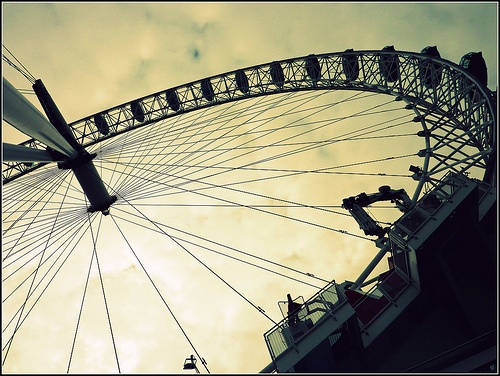 But before Italy was London, and London has my heart. Being a 21-year-old who had only ever traveled with her parents, I was completely reliant upon them to get us around the city. 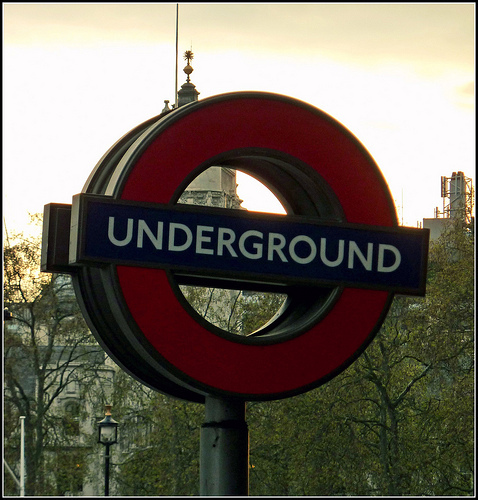 As the Tube seemed too complicated to attempt, we traveled by tour bus or taxi to see Buckingham Palace, Kensington Palace, the Tower of London and more. By some miracle we even found ourselves at Shakespeare’s Globe Theatre on the other side of the Thames. And though we didn’t get to see the Houses of Parliament on foot, we whizzed by on our “coach” a few times. My photos were pretty terrible. I didn’t know anything about Photoshop or post-processing. Terms like composition, exposure and aperture meant nothing to me; I was just concentrating on getting something in my frame. Sometimes I succeeded, and other times not so much. In my own defense, we were on some form of transportation most of the time . . . and it’s pretty challenging to get an amazing shot from a fast-moving tour bus. But looking at it with a critical eye, I just didn’t know what I was doing. The next time I returned, I was ready — and not just with a better understanding of photography. 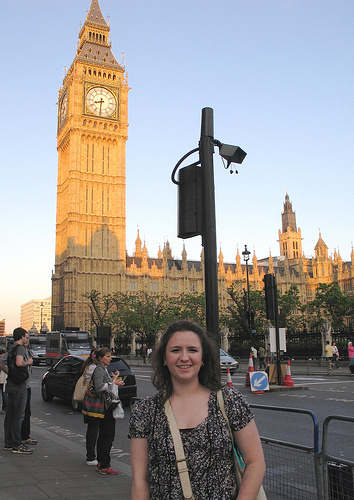 My friend Stacy was studying abroad and living in England, so I knew she could navigate us anywhere we needed to be. We stayed away from very “touristy” spots and favored local eateries. We took the Tube everywhere, and when we wanted to go to Surrey — where I did got to the quite touristy (but awesome) Hampton Court Palace — we took an actual honest-to-goodness train. We were on foot and busy, excited and without trepidation. Stacy was my tour guide, showing me another side of the city I’ve come to love so well. Though my parents dropped me off in D.C. and my friend met me at Heathrow, it was my first time actually traveling alone. If visiting England for the first time was life-changing, visiting for a second time was incredible. When I close my eyes, I can still remember what it felt like to ride the Tube alone headed back to the airport on a quiet Sunday morning. Coldplay’s “Strawberry Swing” came on my iPod, and I looked out the windows and felt . . . alive. Aside from all that emotional growth, the photos I took — those above — were so much better. Between that first and second trip to London, Mom and I took a local photography class. I got really into macro shots and began to understand my point-and-shoot’s settings. Same camera — different perspective. And more knowledge. And more passion. And I wasn’t on a tour bus then. Trust me, I love tour buses — and they’re a great way to quickly get the lay of the land. But if you want the real action? The real deal? You better get your feet on the ground. You better start walking. 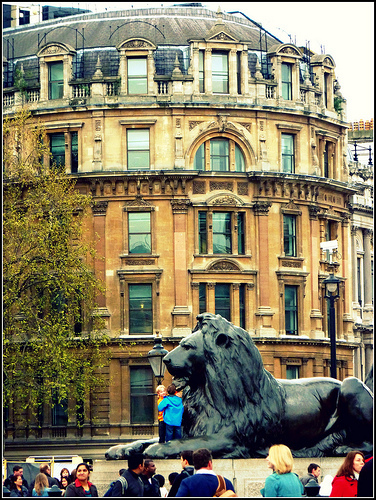 When our travels brought us back to London in April, I had my Canon Rebel in hand. I’ve spent years cultivating my interest in photography and have had plenty of time to obsess over the city. 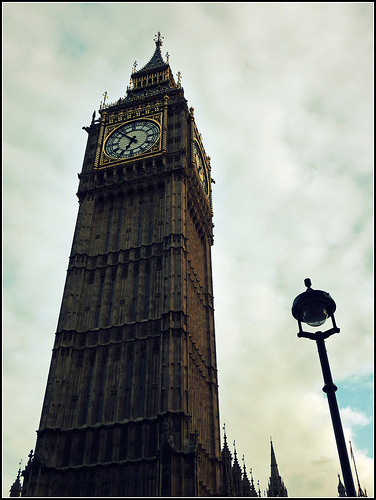 Without a friend there to guide me, I developed an itinerary of what we should see and do during our four days in London — both before our group Trafalgar tour through the U.K. and after. I was the tour guide. And who knows what I’ll see — and how I’ll see it — the next time. This is my second post featuring a recent trip abroad. For the first part, visit here. These are all nasty words to us. Still, prying my jetlagged eyes open at 4 a.m. for a 5 a.m. breakfast time was its own unique brand of torture. I’m notorious for waking up a half hour before I need to be out the door, and rooming with my sister — also a lover of sleep — was a little scary. I set two alarm clocks to make sure we didn’t oversleep. 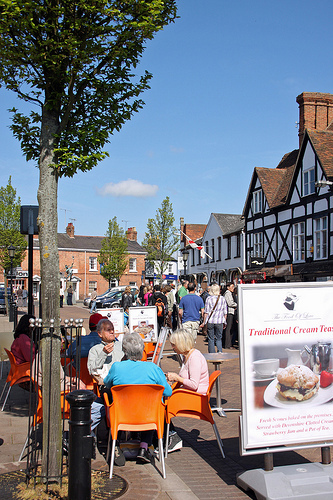 And then it was off to Stratford-upon-Avon, our first “official” stop as part of our Trafalgar tour. We met our wonderful tour guide, Steve, a retired teacher originally from Wales, and he introduced us to the rest of our 51-member group for the next week or so. Traveling in a large group has advantages and disadvantages, of course; all traveling does. But one funny thing about being a part of a tour group is that you all wander into the hotel lobby as strangers but eventually part as friends. At the conclusion of our trip, I can honestly say I got to know — and like — many people on our “coach,” and my horizons? Expanded. 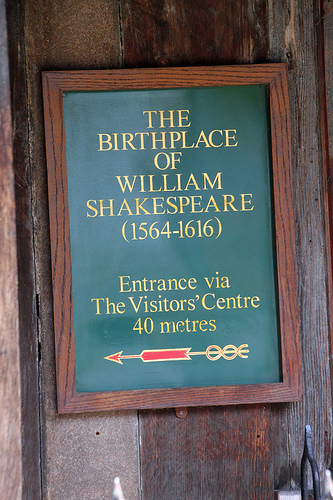 Stratford-upon-Avon is the birthplace of William Shakespeare, famous playwright and poet — and someone I’ve studied extensively. 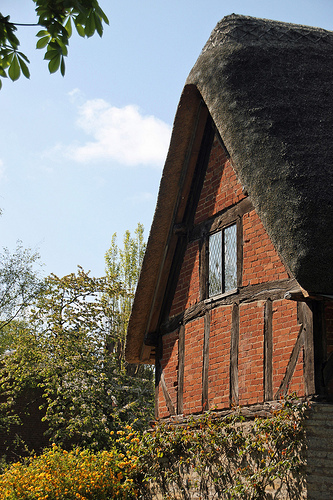 Just outside of town is a cottage that was the childhood home of Anne Hathaway, Shakespeare’s wife. After traversing winding roads and getting my first real glimpse of the English countryside, we arrived at the cottage and had a group photo taken. I took to the gardens like a moth to a flame, capturing the buds from every angle. I also got my first taste of the tour’s unofficial theme: go, go, go. It was absolutely beautiful, though. Set in a lush garden with visitors flocking to photograph every window and thatched roof, I immediately fell in love with the idyllic setting and wished I could just collapse amid the flowers with a book. It was off to the city centre, though, where we had lunch and saw the exterior of the building in which Shakespeare himself was born. And it was quite the popular place. That’s hard for me to believe, I thought, looking up from my tuna panini at the swarms of high school students waiting to enter the Shakespeare Centre. People seemed to be everywhere: ducking in the souvenir shops and books carrying tomes of the Bard’s work; clothing stores with wool sweaters and postcards. Waiting in line for food, coffee, icecream (99 Flake!). The center of town was alive with tourists and locals alike, all meshed together and chatting under a lovely blue sky. 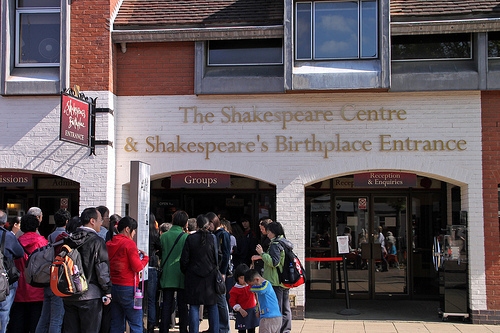 I wondered if Stratford-upon-Avon is a school prerequisite in England; if they visit Shakespeare’s birthplace the way that every student in my elementary school took a short ride to the White House in second grade. Washington, D.C. is nothing different or spectacular for children where I live; everyone has been there or has a parent (or two) that work there. 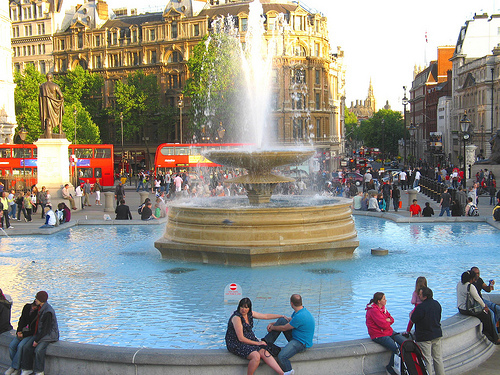 Has Stratford lost its appeal for British children? Is it just another spot to cross off the list — a destination worthy of a field trip and not much more? I hope not. It was really cool. 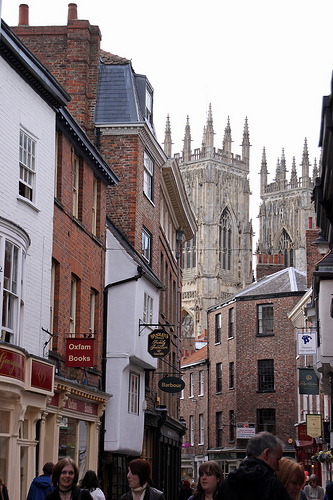 After grabbing lunch and popping into a few shops, we left the town for York, a lovely medieval town a few hours away. Steve escorted us through busy streets teeming with shoppers to see the remnants of an incredibly old structure (sorry, Steve, but I’ve already forgotten what this is!) and spend some time walking through town. It was there that I found my beloved clotted cream fudge — a delicacy I’d never heard of nor experienced until that afternoon — and I whiled away the rest of the afternoon while stuffing my face full of candy. York was very beautiful and impressive — a modern town wedged into a historic one, a place that seems to embody what I imagined “medieval” England to be. 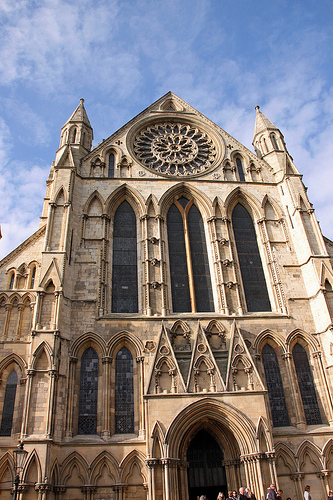 York Minster — the largest Gothic cathedral in Northern Europe — seems to loom up from out of the imagination, too gigantic and amazing to be real. We poked our heads in just as a service was beginning, taking in the powerful organs and artifacts on display. There’s something about being in a cathedral that makes you feel closer to God somehow . . . maybe that’s wrong to say aloud, but it’s true. The way I feel about religion and Christ and the powers that be is completely different inside an enormous structure with high ceilings, stained glass and choirs than in the tiny churches we have at home. It’s just easier to . . . feel something there. Part of that is probably because I was traveling, too. I always feel like a different person — maybe a better person — when I’m on a journey. Maybe travel is my religion. 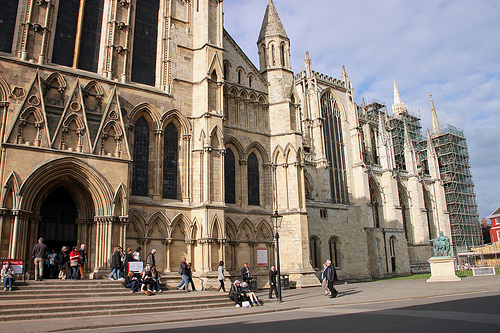 On the steps of York Minster, we listened to a street performer playing hymns on an electronic keyboard while waiting for the rest of our tour group to find their way back to us. Fifty people strong, we were an impressive crowd as the sun was setting — this group of strangers who had traveled thousands of miles to arrive in one spot together. Our first official tour day ended in Leeds, where we enjoyed dinner at the hotel before crashing early. The next day was already catching up to us quick. We would be heading to Grasmere and the Lake District, a place I’d been dying to see since Jane Austen inspired Lake District lust in me, and I needed sleep to stay awake on our journey through the countryside the following day. I dozed off with dreams of clotted cream fudge in my head, threatening to give me sweet and delicious nightmares forever. London is my BFF. 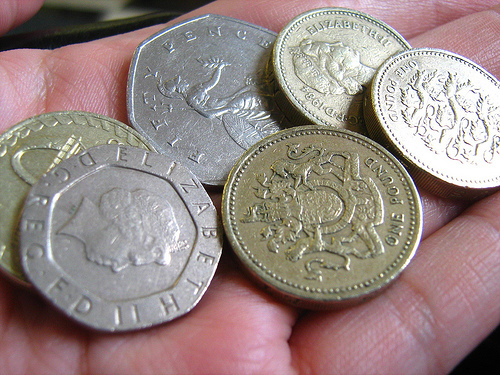 On this, my third visit to England in four years, I wasn’t sure what to expect. It was pre-Royal Wedding week, after all — and having had the greatest time on my previous visit, nerves pulsed in my stomach. 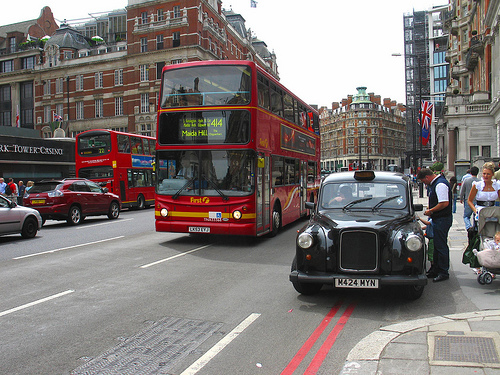 What if London wasn’t the way I remembered it? 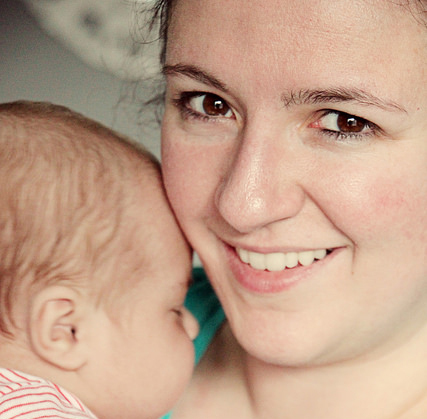 What if — two years later — I felt older, wiser — and thoroughly less enchanted? What if something bad happened and it was forever tarnished for me? Well. It wasn’t tarnished — or anywhere close. It was . . . comfortable. Familiar. It was a place I’d already navigated and seen and photographed, which opened up a whole new door for me: feeling less like a tourist and more like a local. Branching out and doing different things. I wasn’t a local, of course; I was an enthusiast. And I met locals — including Lyndsey — and was still the sweaty, disoriented and Tube map-clutching American wandering around the city with her family . . . but that was okay. I had my bearings. 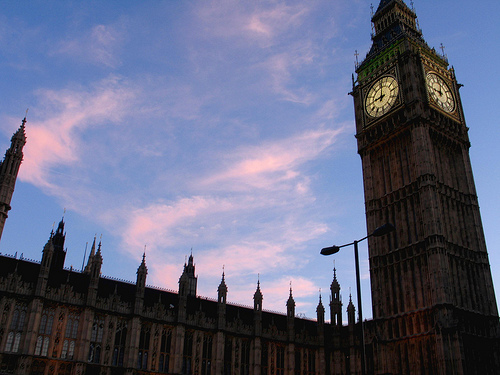 And seeing Big Ben peeking through the treetops still gave me a happy, familiar jolt of excitement. Twice before I’d taken red-eye flights to England and arrived in London just as the city was waking up. This usually left me bleary-eyed and exhausted for the full day ahead of me, so we made a different plan this time: leaving Washington, D.C., in the morning and arriving in London at night. So that’s what we did — getting to Heathrow around 10 p.m. local time. It was a very strange sensation, watching the clouds turned golden as our plane dipped closer to the United Kingdom. “It’s sunset!” I cried at one point, peering at my small watch. Night closed in and encompassed the plane, tampering with my body clock. It was 3 p.m. at home. After a good night’s sleep, it was off to explore the city on Thursday and hunt for royal souvenirs — and that meant leaving our hotel near Heathrow for central London, where we were staying in Islington. With four heavy, 50-lb. suitcases apiece, getting to the next location was a little scary. We packed up our stuff and found a bus that would take us to the closest Tube station, where I was in charge of navigating us to our next hotel. I’ll toot my own horn right here: over the course of our four combined days getting around London at both the beginning and end of the trip, I didn’t get us lost on the Underground one time. This is all thanks to my friend Stacy, who taught me not to be afraid of the train system with its complicated, crazy maze of lines and colors and names. After stowing our stuff, we left to explore the city. We hopped on the Tube en route to Knightsbridge, where we had lunch at Spaghetti House near the world-famous department store Harrods. Exhaustion was setting in at that point, rendering me a hungry, disoriented beast; I woofed down some pasta after laughing with my family about a guy who looked like Edward Cullen on a “date” that didn’t seem to be going well; neither he or the hairbow-wearing lady he was sitting with were saying a word to each other. The man had show-stoppingly good hair. After walking through Knightsbridge, it was over to Hyde Park to try and find “traditional English gardens.” Like me, my mother is never without her camera — and we were eager to find flowers to photograph. It was a gray day, but warm and without rain, so we embarked on foot for the park and a chance to see the Diana Memorial Fountain. And that’s where I screwed up. We’d gotten off the Tube at Hyde Park Corner, which was close to lunch but . . . not the fountain. Without a phone on which to check a map or the location of the fountain, I had no idea how far away it would be — but hey, I debated, how bad of a walk could it be? We’re on one side of the park; the fountain’s on the other. We need some exercise. We can make it. We made it. 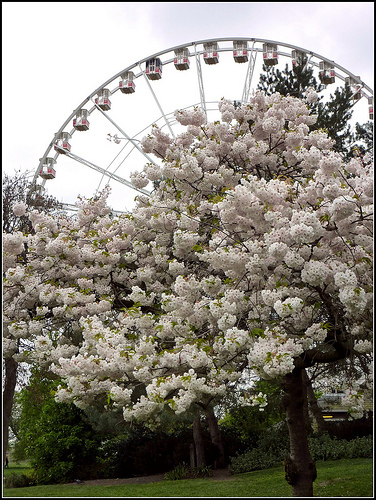 An hour or so of walking, detours throughout the grass expanse of Hyde Park, stops to photograph a few stray tulips and a Ferris wheel that had taken up residence there and . . . we made it. But by the time we arrived at the fountain, we weren’t much in the mood for photographing little kids splashing in the burbling water. And then? 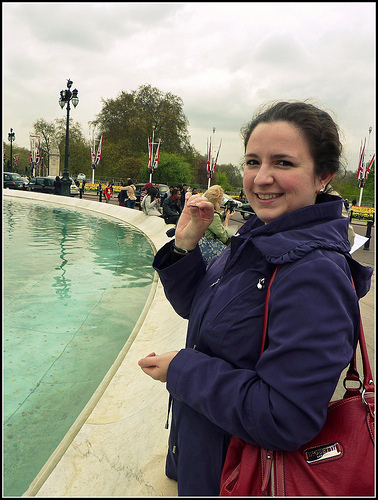 Then we walked from Buckingham to Trafalgar Square, one of my favorite spots in the city, where was I tremendously disappointed to see the fountains weren’t turned on (but I did get to make a wish in the Victoria Memorial fountain by Buckingham)! Crowds still loitered on the steps of the National Gallery and gazed at the large clock counting down the hours until the 2012 Olympics, which will soon take the city by siege. After dinner, my energy level was hitting a low point — and our collective legs were screaming from the miles we’d walked that day. We popped in a Waterstone’s bookstore en route to the nearest Tube stop, where I had fun looking at the differences between British and American book covers (like this one, for Emma Donoghue’s Room). Funny signs littered the store, too, and I really enjoyed the ambiance of wandering around a city bookstore in the evening. Though I left empty handed (trying to preserve much-coveted space in my suitcase! ), it was a fun visit. Friday dawned bright and sunny and, thankfully, I was feeling way better after a good night’s sleep. We hopped over to Covent Garden, another place that had long been on my “to be visited in London” list, and enjoyed soaking up the atmosphere of the busy commercial area. Street performers were swamped by crowds of tourists and locals with cameras and phones, laughing at the antics of a man performing magic with audience participation. I loved walking through the open-air markets and dodging in the little stores. Hunger was taking over by the time lunch rolled around — and how fortunate, because I was meeting up with the lovely Lyndsey of Teadevotee! 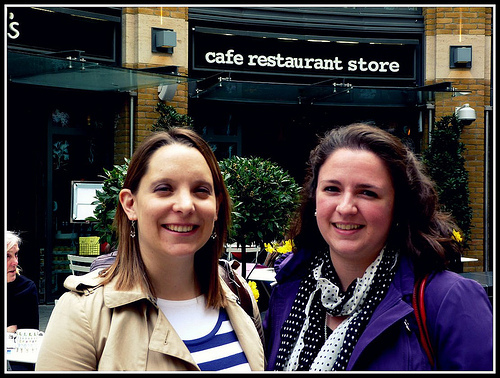 We’d made plans to see one another when I announced my travel plans months before and found each other at Bill’s, a lovely cafe between Covent Garden and Leicester Square. I’ve met up with fellow book bloggers several times before and am never, ever disappointed; Lyndsey was exactly the funny, sweet person I felt I knew. She recognized me just as I recognized her and, after a moment of accidentally appearing in the background of a fashion commercial (?? Oh, London! ), we made it the cafe. Poor Lyndsey probably didn’t expect to dine with a table of journalists. It’s in our nature to pepper innocent people with questions, so the inquisition began: what do you do? What does your husband do? What’s life in England like? Are you excited about the wedding? (I’m sure everyone in London is really, really sick of being asked that.) Lyndsey was gracious enough to answer our countless inquiries and even brought me a gift: a copy of a Jane Austen biography that I’ve never seen and can’t wait to read. Sweetness! We said our goodbyes and snapped a few photos. I tried not to look like the frizzy-haired, jetlagged monster I was. 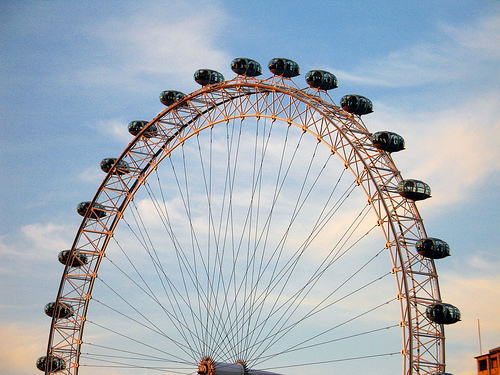 With hours to go before meeting up with our tour group later that evening to embark on an eight-day jaunt through the rest of the UK, Mom, Dad, Kate and I went over to see the London Eye, the famous Ferris wheel constructed in 1999. We queued up with hundreds of people to get a birds-eye view of London, which was awesome — and very different from the air! London is huge. Massive. Sprawling in every direction, giant and encompassing . 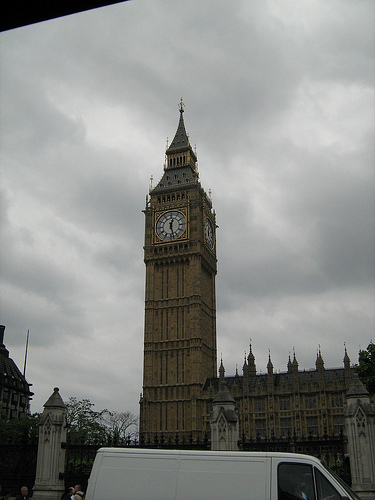 . . and how strange to see Big Ben from the air, where it’s not nearly as majestic as when you’re on foot. We took a riverboat cruise on the Thames River next, which took us up and down the river en route to Tower Bridge and back. I love being on the water — especially on vacation. You see so much more that way. Though I couldn’t snap many photos without someone’s head or camera in them, it was fun to see the city that way . . . and so nice to just sit down. After the boat ride, I convinced my family to walk across Westminster Bridge, which spans the Thames, to get a closer look at Parliament and Big Ben (again). On my last trip, walking across that bridge at sunset was one of my fondest memories . . . magical and surreal. It felt good to be there again, but hard to believe — especially since I wasn’t sure when I’d ever make it across the pond again! We wrapped up our third night in the city by having dinner at the hotel and getting a good night’s rest — and we’d need it. On Saturday morning, our alarms chimed at the ungodly hour of 5 a.m. local time to begin the leg of our tour with Trafalgar Tours, which I’ll tell you all about . . . next time. Hint: it involves the English countryside, cathedrals, countless medieval streets and clotted cream fudge. If nothing else, you have to come back for the fudge. Big news! Big, big news. Two years after I last made a journey across the pond, I’m returning to the UK! With a tour group in April, I’ll be visiting Stratford-upon-Avon, York, Bath, Leeds, Stonehenge and London, my favorite city in the world, as well as a host of other cities in Ireland, Scotland and Wales: Glasgow; Edinburgh; Belfast; Dublin; Kilkenny; Waterford; and Cardiff. It’s going to be action-packed, crazy and exhausting. I’m going to fill up a hundred memory cards and come home with more photos than I can possibly edit or post. I’ll be making memories left and right as I travel through several countries with my family, and I’ll miss Spencer the whole time I’m gone. But it will be incredible. The last time I visited Europe with my family, I had just graduated from college and was just getting ready to start my first full-time job — the one I have now. This spring, I’ll be gone from work for almost two weeks — the most consecutive time I’ve had off in four years. By far. Because of a long weekend and holiday when I visited my friend Stacy in London last time, I only missed two days of work! So . . . you know. It might get a little chaotic around here. But whatever I have to do in anticipation of leaving, I’m going to do it. I want my head clear when I get on that plane, and I will enjoy the heck out of my scheduled, orchestrated and very stringent time off. Some people cringe when I mention we’re going to travel around Great Britain and Ireland with a tour company, but honestly? For us, it’s the way to go. You don’t have to worry about transportation or most meals; the highlights you’d want to experience in each city are planned. Because we’re with a group, we don’t wait for most attractions. We show up with our one (overflowing) suitcase, sit back and prepare to have fun. And that’s just what I’ll be doing. The downside? Well, it’s the same as the upside: everything is planned for you. With few exceptions, your days are packed — and there isn’t much room for a detour. That being said, if I have to go AWOL from the group to make sure I get to see the Jane Austen Centre in Bath, that’s what I’ll do. Ain’t no way I’m missing that; I’ll hitchhike back to London if I have to. I can’t be in Bath — so, so close to the Austen exhibit — and miss it. Art made by my mom — for my birthday! 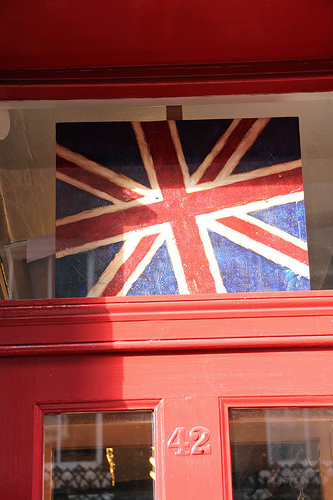 This baby will soon join all of the other British pieces adorning my office. As if my coworkers needed another reason to think I’m silly . . .